Stuffed shrimp is a fun, flavorful way to spice up your dinner (or lunch). Not only is it pretty, it's simple to make and takes less than half an hour! It's a perfect quick dinner item, or a great appetizer for a potluck. I prepared the shrimp as a bowl. It's a great lunch item, and the avocado is a perfect way to complete the dish. 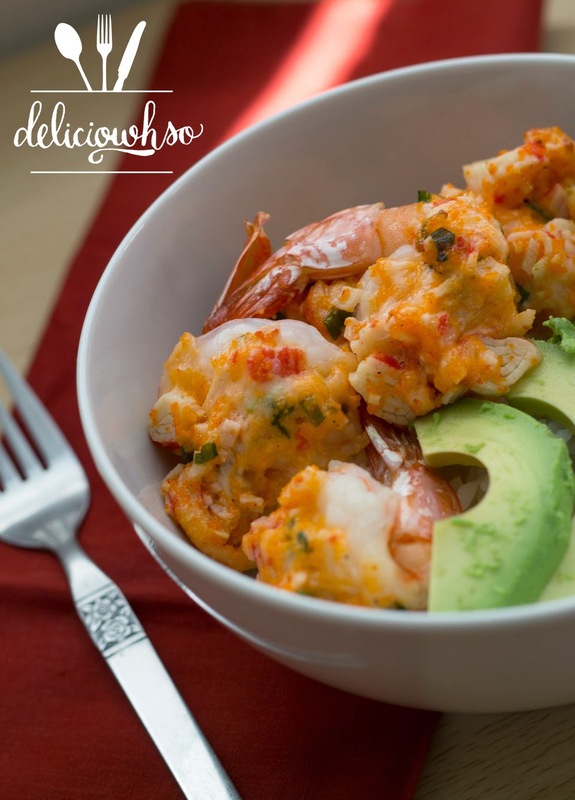 The creaminess of the avocado compliments the tangy shrimp superbly. Rice is a necessity with this dish- I can't imagine eating it without it. 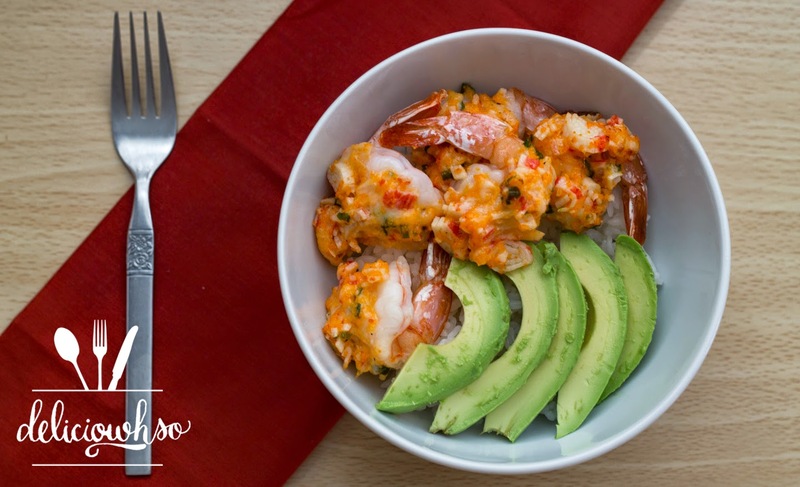 The rice balances the saltiness from the shrimp and just adds another dimension of flavor. 1. Peel, devein, and clean shrimp. 2. Cut the back of the shrimp toward the belly to butterfly the shrimp. ensure that the halves stay intact. 3. Lay the shrimp out onto a sheet pan and preheat your oven to 350 degrees F.
4. Chop green onions and imitation crab meat into about 1/4 inch pieces. 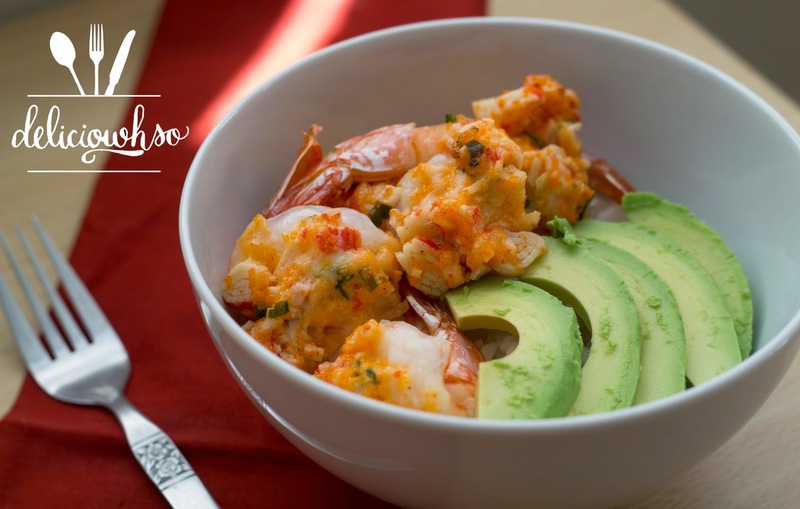 Place into a bowl with masago, mayonnaise, and mozzarella cheese. 5. Season the mixture with salt, pepper, and garlic powder to taste. 6. Generously spoon the mixture onto the shrimp, making sure the portions are even. 7. Bake for 15-20 minutes, until the shrimp is completely cooked. If you are a rare person who doesn't like shrimp, you can put the stuffing on any fish to bake. It's great on salmon. Another alternative is to bake the stuffing in a casserole dish and mix the stuffing with rice. It is amazing!